Merry Christmas everyone!!!! I am so excited for tomorrow! My kids are still at the "eyes all aglow" age and still really really believe in Santa Claus. It is so fun to get to see them be so into the true joy of the season. We finished up a few ornaments tonight (the wooden kind you paint from Michael's) and then drove around looking at Christmas lights. 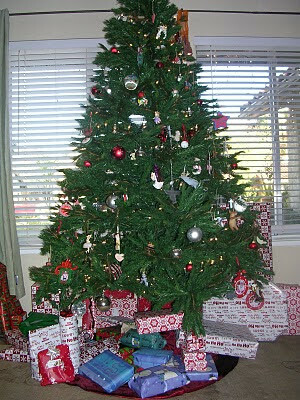 This is our Christmas tree this year. 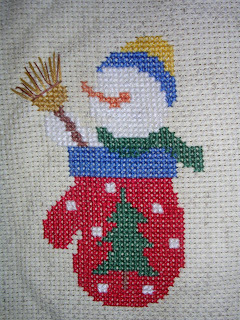 This is a little snowman one that was made for me by a friend. Everyone always assumes I made it since I do so much stitching. 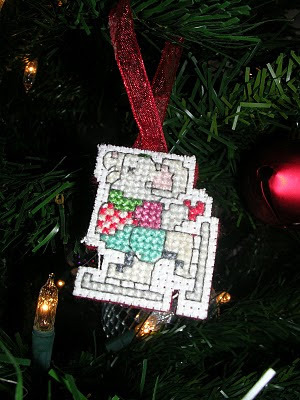 So yes I have a total of two x-stitched ornaments on my tree. But lots of homemade ones by my girls which are really my favorites anyways. Hallmark just can't match an inspired toddler with some glue and love thrown in the mix. And this is my little bit of progress on walk in the woods. 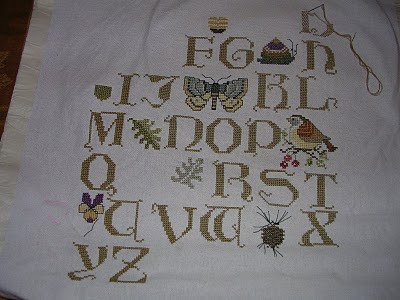 Only five more letters left to go, I am hoping to have it done by the end of the year. It has been so much fun to stitch. I hope everyone has a wonderful blessed holiday tomorrow. MERRY CHRISTMAS to all and to all a good night! Yet again my math skills have led me astray. My sweet (and more technically minded husband) even made me a chart on how big I needed to cut my squares for this pillow. 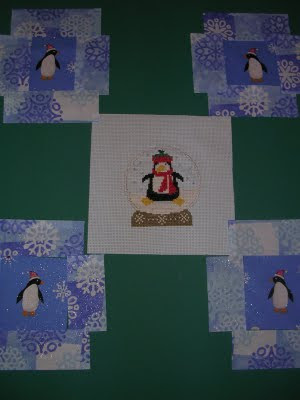 Its the same size/design as my Harvest Blessing pillow but I wanted to "frame" the little penguins in the snowflake fabric and somehow it did not come out right. I cut most of my fabric today and am going to sew it together tomorrow once i figure out where I went wrong, and possibly re-cut half of what I did today...sigh. Hopefully it will turn out super cute and be worth all this math. 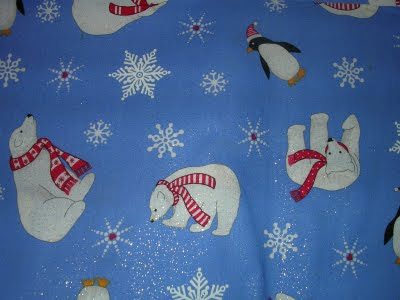 This is the Debbie Mumm fabric I used from Jo-Ann's. The fabric decided me on making this years Bent Creek snow globe as I realized the little polar bears would work great with the polar bear snow globe. 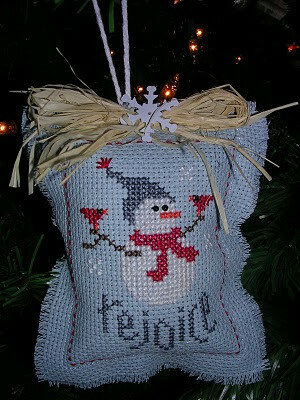 So that will be my pillow for next Christmas and then I will have matching pillows for each side of my couch. Plus this leaves me a whole year to get it done! Here is my little bit of progress on walk in the woods. Only eight more letters left to go. I am really loving this design, and its pretty easy since the letters are only one color so there is not that much switching threads around. I had thought about doing the letters in Weeks thread so they would be a little more colorful, but I like the way this is turning out with just DMC. I am excited to hang this on my wall. It has been a pretty quick one, I have only been working on it for about a week and a half now. No I didn't fall off the planet!! 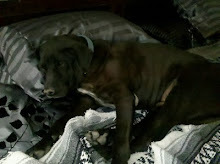 I haven't blogged in a month, and I feel so guilty! I also feel like the month of November ran me over with a snow plow! It went by so quick, and it felt like I was sooo busy. We spent the week of Thanksgiving up north at a place called Hannigan's Meadow in a cozy log cabin. We cooked Thanksgiving dinner up there, and the kids got to play in the snow and the woods. The pictures below are of our family in front of the log cabin we stayed in. woods because she thought the bears would eat her. It was very pretty but I am glad we don't live somewhere that snow boots and mittens are needed. It took fifteen minutes just to get them in and out the door! 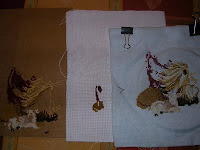 I have been a busy stitcher though, this is a new one I started called "Walk in the Woods". It is an old one by Cross Eyed Cricket published in 1996. 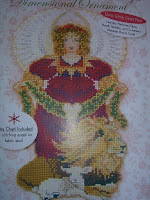 I saw it in my LNS and loved it, I am not sure I would have bought it if I hadn't seen the stitched model. Sorry it's so wrinkly I just took it out of it's hoop to get the pic of it. This is my failed x-mas project for my sister. I am starting to think it is just not meant to be. The picture on the left is the actual chart cover. The THREE pieces on the left are all of my failed attempts at doing it. I started with the perforated paper that came in the kit. It said to use 3 strands of thread, and 2 strands + 1 strand of Krenlik for the sparkly parts. Well perforated paper is not meant to withstand all that thread and I now have a hole in the middle of my design that I can fit my pinkie through! So I started over on even weave using 1 strand of thread, and 1 strand + Krenlik for the sparkly parts. 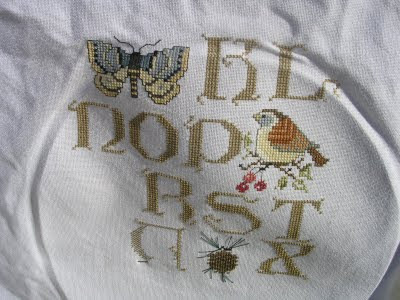 Well it quickly became to tight to stitch, so finally I started over AGAIN on Aida. Which was actually going okay until I lost the chart somewhere in transport between home and work (I'm lucky enough to get a little stitching done during the slow parts of my job). So now until I find the stupid chart again (cause there is no way I am buying this one again) it will be left as a UFO. I'm just glad I actually bought my sister a gift just in case, so at least I have a backup in case I never find the chart. UuuuuuGgggggggHhhhh!!! 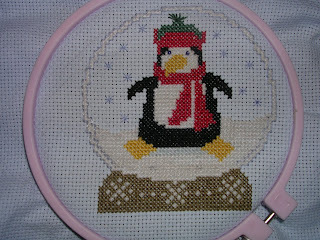 This is Bent Creek snow globes penguin I started last year. I just had to finish the snow at his feet, so I got him done last week, and am planning to make him into a pillow like I did with the Harvest Blessing one in Fall. I like him, but I used DMC instead of Weeks, so his scarf didn't turn out as cute as the chart, also the chart used a darker blue fabric in the background so the snow showed up a little better. Next time I'll know better. I love the polar bear one from this year, but not sure I like it enough to want to pay $24 bucks for the kit. And this is the Lizzie Kate one I am making for my own tree. I only have one tiny 1" by 1" mouse ornament for my own tree, so I decided I would make an ornament from now on each year for my own tree, since I have made tons of ornaments for my brothers and sister but never keep any for myself. Also the mouse ornament is my favorite one each year to get out of the ornament box, just because its homemade. 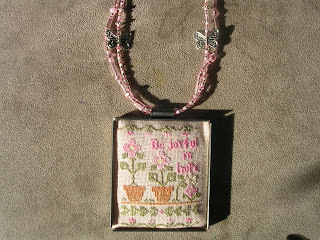 Last but not least this is the Pink Exchange piece finally finished into a beaded necklace. I was a little bummed my partner didn't post a pic on the Hooked on Exchanging website. So I wanted to post a pic of it here. It turned out to be 1.25" by 1". 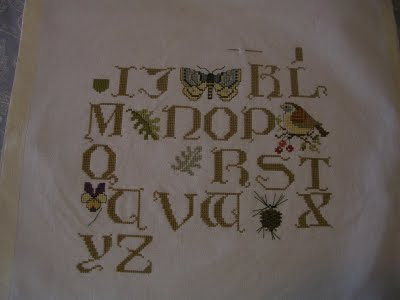 It was a Little House needleworks design stitched one over one on 30ct linen. I almost wanted to keep it for myself! I might make have to make it again.